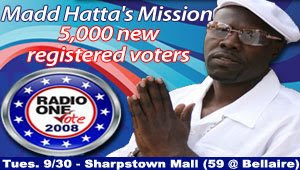 Brother Jesse Blog: Houston's Madd Hatta of 97.9 The Box Goes for 5,000 New Registered Voters Today! Houston's Madd Hatta of 97.9 The Box Goes for 5,000 New Registered Voters Today! 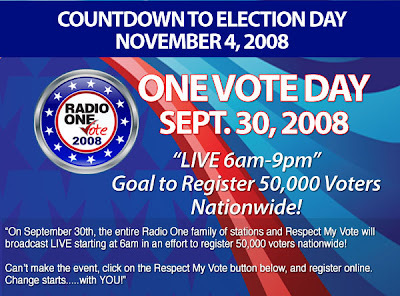 Radio One, Inc. along with the Hip Hop Caucus – Respect My Vote Campaign is planning to set a World Record by registering more than 50,000 eligible persons in one day during the “One Vote” National Registration Drive Tuesday, September 30th from 6:00am to 9:00pm. Working with Radio One in 15 cities across the country that include Atlanta, Indianapolis, Baltimore, Detroit, St. Louis, Charlotte, Raleigh-Durham, Cincinnati, Cleveland, Columbus, Philadelphia, Dallas-Ft. Worth, Houston, Richmond and Washington, DC, the Hip Hop Caucus will attempt the first ever one-day 50,000 person voter registration drive through live call-ins, online and on-site registration. ATTENTION HOUSTON! Starting at 5am, Houston's own Madd Hatta of 97.9 The Box will stay on the air until he personally registers 5,000 new voters! He will be airing live from Sharpstown Mall so everyone that is not registered to vote please go and join the movement. WHO: 97.9 The Box's Madd Hatta and the morning show team. All of Houston's entertainment community will be invited to show up and show their support so you never know who will turn up. WHAT: Radio One Inc., 97.9 The Box, Respect My Vote and Houston Youth Vote "One Vote" voter registration drive. WHEN: Tuesday, September 30th - 5AM until 5,000 people have registered to vote. Maaan that's going to be tough to accomplish but I hope they get the 50,000. we need it!